Home » hair growth » natural hair » SCALP EXFOILATE » SCALP MASSAGE » SCALP SCRUB » GET YOUR BEST HAIR GROWTH... IN 2 EASY STEPS! GET YOUR BEST HAIR GROWTH... IN 2 EASY STEPS! IT IS NECESSARY TO CULTIVATE THE SCALP TO GROW HAIR AS IT IS TO CULTIVATE THE SOIL TO GROW A GARDEN. The other day I started thinking about when my hair was in it's "healthiest" longest relaxer state. Even though my hair is the longest it has ever been now, I realized that it was a few things I was doing then that I'm not doing now because I'm not going to a stylist on a regular bases. Doing that time/now my stylist name was/is "G" and he is a master stylist. He had my relaxed hair doing things I didn't even think were possible. Now some may argue that male stylist make your hair grow because of hormones, but I say he just knew how to make your hair grow. Let's explore 2 things that I learned from this man that I will be re-introducing myself to starting this week. When it comes to hair growth, let's get to the root of the matter...scalp health. Every hair comes out of the scalp through the hair folllicle. At the base of each hair follicle is the papilia aka the ''root', through which a supply of oxygenated blood feeds hair growth via blood capillaries. The constriction of blood aka the food supply as well as the prevention of a proper oxygen flow can lead to hair growth problems. When we deep cleanse the hair follicles and stimulate blood flow to the scalp, this enhances the atmosphere for the optimal hair growth. It can be dirt, pollution, residue from hair products, stress, hormonal fluctations, illiness, phamaceutical or illicit drugs, and poor diet; all of which comes into play as an intergral part of preventiong hair growth. G always paid attention to the health of my scalp by exfoliationg and massaging the scalp every two weeks. I think this is the real reason my hair always prospered in his care. 1) Exfoliating the Scalp : Exfoliation of the scalp not only removes dead skin cells, but eliminates buildup from hair products as well. Regular exfoliation results in a clean, healthy scalp and can even aid in hair regrowth for sufferers of scalp psoriasis. Just apply the scalp exfoliator recipe to the scalp. 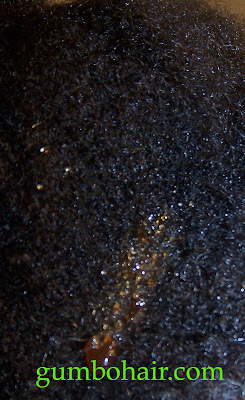 I parted my hair with my hands, then applied the scalp exfoliator mixture. I lightly and gently massaged my scalp with my finger tips in a slow circular motion. I could feel my scalp freeing itself from the pollutants that were clogging it. This took me about 10 to 15 minutes to go through my whole head. I put my deep conditioner mix on my dry hair for a couple of hours, then washed my hair like normal. I will do this about once a month. I will update in 4 months concerning increase hair growth. SIDENOTE: Just like we shouldn't scratch our scalp, because it could cause damage, make sure to massage your scalp gently. Don't massage the scalp abrasively with mixture, because this could lead to scalp tearing as well. Our scalp can also be exfoliated by using an oil (neem, avocado or any oil of your choice) and a warm towel. Just apply the oil to your scalp, then insert finger tips in a warm towel and lightly scrub in a circular motion. This is a less abrasive scalp exfoliate method. CHECK OUT THE ABOVE VIDEO. NOTICE AROUND THE 4:23 MARK HOW THE DOCTOR IS CLEARING THE SEBUM OFF OF THE SCALP. 2) Massaging the Scalp: G was known for the most relaxing deep scalp massages in town. Women would come from all over the country just so he could wash there hair. None of that quick wash half scatching shampoo job, no he actually stroked pressure points as he deep massaged his clients heads before and as he was shampooing. The art of scalp massage will cause scalp circulation to increase as well as major hair growth to take place. The constriction of blood and food supply to the scalp leads to hair thinning. Since we don't all have a G in our life, we can still practice scalp massages on a daily basis. I massage my hair now for 10 to 15 minutes on a daily basis. My scalp always feels lovely after each massage session. Now if you don't have time to massage your scalp every day, there are devices that you can purchase that can do it for you... end walks the ultimate scalp massager. Ladies, Ladies, Ladies, this scalp massager will change your life. I tried this last week in the Brookstone store and it was the business! 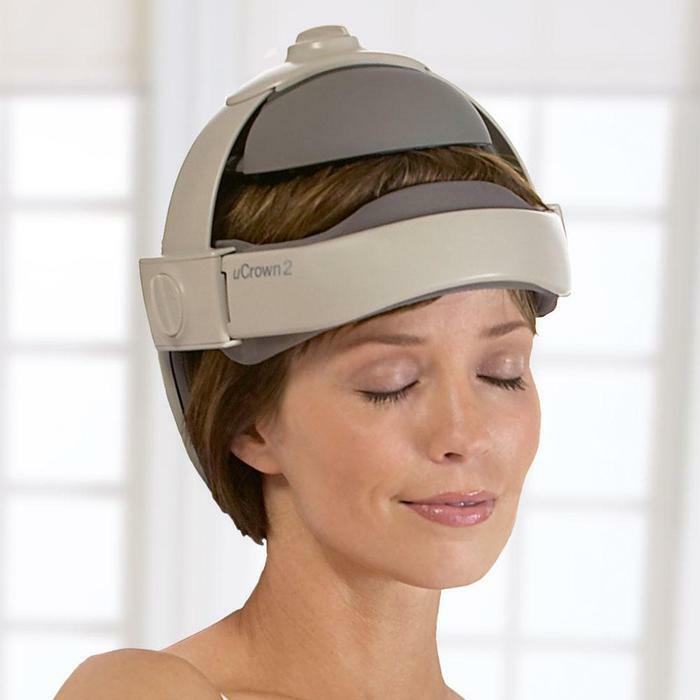 This patented air pressure technology, vibration massage, magnetic therapy, gentle heat and soothing music combine to deliver a tension-relieving, circulation-boosting treat to your head and scalp. The unique "human touch" acupressure massage is designed to simulate the hands of a professional massage therapist. My eyes started rolling to the back of my head...I had a moment right there in the store. LOL! Go to your local store and bring an alcohol wipe to wipe the insides down...then try it for yourself. There are also numerous reviews of people using it to take the bite out of migraines as well. So what are some of your hair growth tips? I just bought a body heat massager to use on my 91 year old client. It has a scalp massager attachment, I was thinking about using. After reading your article, I will use it tonight.